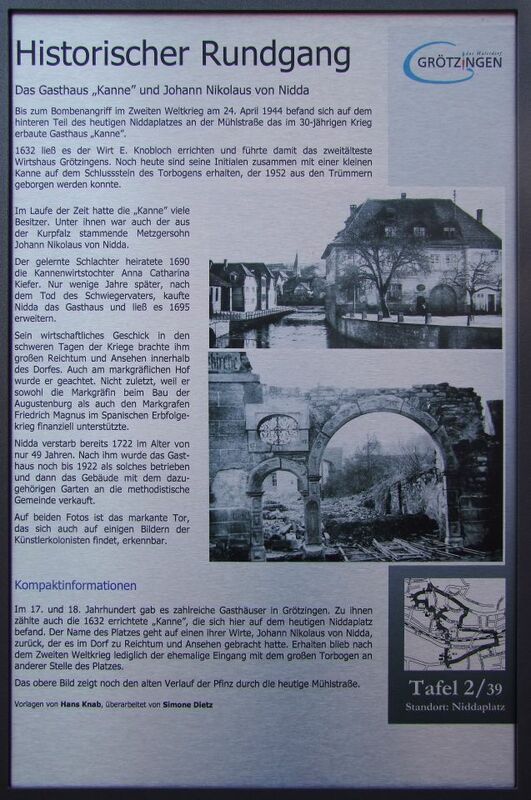 Until the bombing in World War II on April 24, 1944 was located on the rear part of today Nidda place at the Mill Road, which was built in the 30-year war inn "Kanne". 1632 made ? ?it the host E. Knobloch build and thus led the second oldest inn Grötzingens. Even today, his initials are obtained along with a small pot on the keystone of the arch, which could be in 1952 salvaged from the wreckage. Over time, had the "Kanne" many owners. Among them was a native of the Palatinate butcher's son Johann Nikolaus von Nidda. A trained butcher married 1690 Can landlord's daughter Anna Catharina Kiefer. Only a few years later, after the death of the father, Nidda bought the inn and let it expand in 1695. His economic skill in the difficult days of the war brought him great wealth and prestige within the village. Also on margravial court he was respected. Not least because he supported both the Margravine in the construction of Augustenburg and the Margrave Friedrich Magnus in the War of Spanish Succession financially. Nidda already died in 1722 at the age of only 49 years. According to him, the inn was still operated as such until 1922 and then sold the building with the associated garden at the Methodist church. On both photos is the distinctive goal that is also found on some pictures of the artist colonists recognizable.